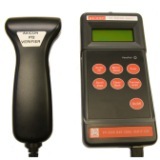 The PV-1072 is the simplest Axicon verifier for point-of-sale barcodes, and is fully portable. It is powered by its own display and data collection unit which runs on four AA batteries. Rechargeable batteries can be supplied with a charger if they are required. A protective rubber cover for the data collection unit is also available. It can be used to verify all retail point-of-sale barcodes (EAN-13, EAN-8, UPC-A UPC-E and GS1 Databar), as well as pharmaceutical product barcodes (such as CIP 39, Italian pharmacode, HIBCC, and Code 128). The scan width of the reader is 66 mm. It enables you to save or print simple text files that provide a summary of each barcode’s verification. The saved text files can be transferred to a PC using a USB memory stick for subsequent printing, or printed out to a serial (RS232) printer. Although the read-head of the PV-1072 looks very similar to the Axicon 6015, it cannot be used with a PC, or a PV-1000 unit, to provide more detailed results. Unlike all the other Axicon verifiers, it can only save or print the results as a text file. This means it provides less detailed information about each barcode, but if you simply want to know the ISO/IEC grade for a symbol, it does this job perfectly. ISO/IEC verification standards, symbology auto-discrimination, automatic variable aperture, display of x-dimension and magnification, text file printing or saving. CCD trigger ISO compliant linear barcode verifier. Aperture automatically switchable between 3, 5, 6, 10 and 20 mil. Scan width 66 mm (including quiet zones). Wavelength of light 660 nm. Weight: 230g. Size:165 x 75 x 55 mm.